Using the mapping tool, go to the site of interest by magnifying the image or entering an address. In this example, six sites are shown. Make sure the Legend (lower left) displays the proper legend. Infiltration is acceptable at site 1 because, even though it overlies an Emergency Response Area (ERA), the site is located in an area with low vulnerability. Infiltration is prohibited at site 2, unless a higher engineering review indicates infiltration is acceptable, because it is a DWSMA with high vulnerability. Infiltration is acceptable at site 3 because it is not in an ERA and is in a low vulnerability DWSMA. Infiltration is acceptable at site 4 because it is outside an ERA and DWSMA. Infiltration is prohibited at site 5 because the area overlies an ERA and vulnerability is high. Infiltration is prohibited at site 6, unless a higher engineering review indicates infiltration is acceptable, because the site overlies an ERA in a moderate vulnerability session. Schematic illustrating construction stormwater permit prohibitions for infiltration. In this schematic, infiltration is not allowed at the site because it receives stormwater discharges from a vehicle fueling area and from an industrial facility where infiltration is prohibited. Schematic illustrating construction stormwater permit prohibitions for infiltration. This schematic describes the limitations for infiltration. Groundwater flow beneath the site is from right to left. Native soil is shown in brown and the infiltration practice is in blue. Note that the separation distances from the infiltration practice are the shortest distances from the practice to the feature requiring separation (e.g. bedrock, active karst, etc.). Designed infiltration of stormwater is highly encouraged and generally preferred by regulatory agencies and stormwater practitioners. However, under certain conditions designed infiltration of stormwater presents an unacceptable risk to groundwater. Section 16 of the Construction Stormwater permit includes several prohibitions to infiltration of stormwater. Vehicle fueling areas represent a relatively high risk for spills involving highly mobile and toxic chemicals. 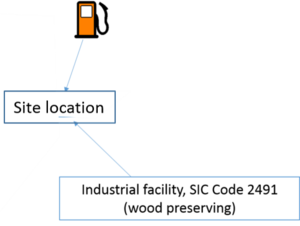 Gasoline compounds in particular are mobile and contain chemicals that represent a significant risk to human health and the environment (e.g. benzene). Standard designs for infiltration practices will not be adequate to treat runoff with high concentrations of these chemicals and the chemicals will readily leach through the underlying soil, thus representing a risk to groundwater. 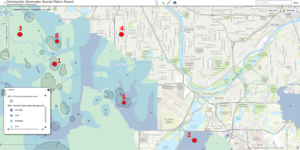 For more information, see the section on potential stormwater hotspots. 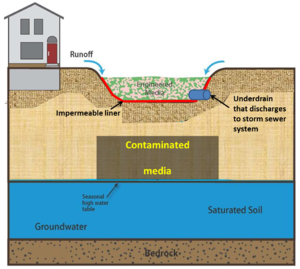 Stormwater infiltrating below an infiltration practice may require additional treatment even after passing through the media or soil in the infiltration practice. The distance needed to provide adequate treatment varies with soil and pollutants in the infiltrating water. For example, soils with high clay or organic matter contents typically retain pollutants better than sandy soils having little organic matter. A separation distance of 3 feet is commonly used for other types of infiltrating water, such as water infiltrating from a septic drain field. A separation distance of 5 feet is recommended, particularly in sandy soils, but a minimum of 3 feet separation from either bedrock or the seasonally high water table is required. For more information see the pages on shallow soils and depth to bedrock and shallow groundwater. Infiltration is prohibited at certain industrial facilities where infiltration represents a potential risk for groundwater contamination. This prohibition exists for 5 Standard Industry Code (SIC) sectors. Sector A (SIC 2491) - wood preserving. Although the prohibition on infiltration at these sites does not apply to infiltration practices operating prior to April 5, 2010, the prohibition in the construction stormwater permit applies to all facilities operating under these 5 sectors. Infiltration is not allowed at any site receiving stormwater discharges from a facility operating within one of these 5 sectors. For more information, see the page on stormwater infiltration at permitted stormwater industrial sites. Infiltrating stormwater that passes through contaminated soils or comes into contact with contaminated groundwater has a high potential to mobilize those contaminants. In addition to representing a risk to human health and the environment, mobilizing contaminants creates legal liability risks for the owner and operator of the infiltration facility. It is difficult to define what high levels of contaminants are and it is often difficult to determine if infiltration will come into contact with contaminated soil or groundwater. An example of a site where infiltration is prohibited is shown on the right. The manual contains guidance on infiltration at sites that are or may be contaminated, including a screening assessment for contamination at potential stormwater infiltration sites. D soils have very low infiltration rates (0.06 inches per hour in the manual). Over a 48 hour drawdown period, a soil with an infiltration rate of 0.06 inches per hour would only infiltrate 2.88 inches of water. Consequently, infiltration practices, such as bioinfiltration, permeable pavement with no underdrain, and infiltration basins are not feasible. 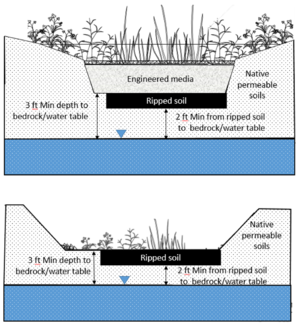 Low infiltration rates result in extended surface ponding of water, which may damage vegetation, lead to mosquito breeding, damage soil structure, and reduce pollutant treatment by the BMP. Active karst is defined as a terrain having distinctive landforms and hydrology created primarily from the dissolution of soluble rocks within 50 feet of the land surface [Minn. R. 7090]. A site with active karst has the greatest potential for development of a sinkhole below a BMP. Sinkholes can lead to catastrophic failure of a BMP. In addition, focused infiltration and recharge that results from collecting and infiltrating large amounts of stormwater at a discrete site can enhance sinkhole development. Infiltration practices must therefore be a minimum of 1000 feet upgradient or 100 feet downgradient of active karst. This diminishes the likelihood that the infiltration practice will contribute to sinkhole development. For more information, read the section on karst. the DWSMA is classified as moderately vulnerable and overlies an ERA, unless a higher engineering review sufficiently provides a functioning treatment system that prevents adverse impacts to groundwater. For more information see the section on stormwater and wellhead protection. Soils with very high infiltration rates have limited ability to attenuate pollutants since water is moving rapidly through the soil. A value of greater than 8.3 inches per hour is used to identify soils where infiltration is prohibited. These will typically be well sorted medium- to coarse-sands and gravels. These soils typically have low concentrations of organic matter, which makes them further susceptible to pollutant leaching. These soils must be amended to slow the infiltration rate below 8.3 inches per hour. This page was last modified on 28 August 2018, at 16:37.